Here’s a simple procedure that lets you get a solid zero for a hunting rifle in just four shots. Of course you probably want to fire a few more rounds to confirm your zero before you head off to your hunting grounds, but this will let you get on-target with a minimum amount of time and ammo expended. 1. First, remove the bolt and boresight the rifle so you can see the center of the target through the bore. Secure the rifle in the rests to maintain its position as boresighted. 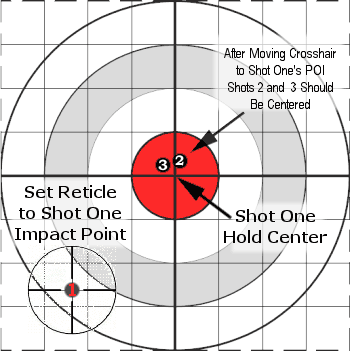 Then, without moving the rifle, center the reticle. That should get you on paper. With the rifle solidly secured in front and rear rests or sandbags, aim at the center of a target placed at your zeroing distance (100 or 200 yards). Fire one shot. Then, return the gun to the exact position it was when you pulled the trigger, with the cross-hair centered on the target as before. 2. Locate, in the scope, where your first bullet landed on the target. Now, while you grip the rifle firmly so it doesn’t move, have a friend adjust the turrets on your scope. While you look through the scope, have your friend turn the windage and elevation turrets until the cross-hairs, as viewed through the scope, bisect the bullet hole on the target. In other words, you use the turrets to move the center of the reticle to the actual position of shot number one. Share the post "Four-Shot Sight-In for Hunting Rifles"
Midsouth Shooters Supply has recently added Berger Bullets to its inventory. Midsouth’s representative informed us that: “Finally after about 4 years of discussion, [Midsouth has] picked up Berger Bullets. Our prices are very competitive. We actually based our final decision after reading some of the 6mmBR articles and looking in your forum and seeing how many of your shooters prefer Berger.” We applaud this move by Midsouth. This should give our readers a new affordable source for Berger match and hunting bullets. Also check out Midsouth’s Fall “E-Flyer”. There are many good deals, including a handsome, khaki shooting cap for just $2.99 (with purchase of other items). Act soon though–the last batch of these promo hats sold out quickly. Share the post "MidSouth Now Carries Berger Bullets"